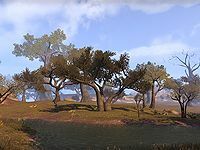 Reaper's March is a region connecting the jungles of northeastern Valenwood with the rolling plains of northwestern Elsweyr. The northwestern woodlands are called simply the Northern Woods, which give way to Jodewood in the south. Eastern Reaper's March is called Dawnmead. The Strid River forms its northern border, separating it from western Cyrodiil. It is home to the cities of Arenthia, Rawl'kha, and Dune, as well as some smaller settlements and Ayleid ruins. The walking city Falinesti has been known to spend the autumn in the Northern Woods west of Rawl'kha. The March has a unique mixture of Bosmeri and Khajiiti culture, along with some Imperial influence. The senche-tigers native to the area are believed by the locals to have mystical alchemical properties. Despite the dry conditions of Reaper's March, the Khajiit have managed to farm and harvest moon sugar in the area for generations through extensive irrigation projects. While bandits and skooma smuggling is common, Daedra worship is minimal. Khajiiti temples in the region are noted for their awe-inspiring beauty, though there are many other monuments and grand structures which are decayed and ruined. Reaper's March has a particularly bloody past. Besides conflicts between the Khajiit and Bosmer, Colovian kingdoms have made a number of sorties into the region over the years, and some soldiers from these campaigns decided to stay and put down roots in Reaper's March. Southwest of Arenthia is the town of Greenhill, which is near the famous burial site of Thibaut's Cairn, where many of the most respected, wealthy, and powerful individuals are interred. It takes its name from the famed Colovian general Thibault of Kvatch. During the Alliance War circa 2E 582, the Colovian Estates attempted to annex land in Reaper's March, and called on "Freeborn Colovians" in the area to join them with the promise of riches and land grants. Though the region at the time was aligned with the Aldmeri Dominion, some Khajiit seemed to be more concerned about Dominion spies, the so-called Eyes of the Queen, than about Imperial incursions. They joined the Dominion because of the help they had provided in overcoming the devastating Knahaten Flu, but all understood that the Dominion had provided this help as a matter of policy, not as a matter of friendship.